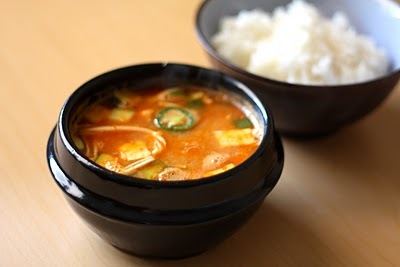 Doenjang jjigae is a Korean kitchen staple that’s easy, delicious, and incredibly good for you. According to Sean of Take Thou Food, the secret to excellent jjigae is choosing a quality doenjang and anchovy stock. It may be a simple meal, but it’s one of the most flavorful of them all. Notice that no salt is added at any point while making the stew. The fermented soybean paste is salty as it is and you can add a little more to the stew if you need that extra seasoning. The chili flakes add a nice kick and changes the color of the soup to a vibrant, reddish brown color. In a hot pot, add the tablespoon of sesame oil. Once the oil is hot enough, add the doenjang, minced garlic and uncooked steak. If you’re using leftover steak, we’ll add that in later. Stir the steak around for a minute or two along with the doenjang until the steak is browned. Take care not to burn the paste and garlic. Add the diced onions and potatoes and cook for another minute. Add the 2 cups of anchovy stock and bring up to a boil. Once at a boil, cook for about 2 minutes so the potatoes start to get tender. At this time, add the zucchini in (and the leftover steak if using). Cook for another 2 minutes. Add the gochugaru in and stir to incorporate into the stew. Add the diced tofu and cook for another minute to warm the tofu through. Be careful while stirring at this point as the tofu will break apart if the stew isn’t stirred gently. To finish, add the sliced jalapeno and enoki mushrooms and cook for another minute. Serve immediately with fluffy rice. We’re always looking for new, exciting content here at Kimchi Chronicles. Got a food blog with some tasty Korean dishes? Give us a heads up at info@kimchichronicles.tv.